Thoughtshower: Will Nuclear Power Europe's Future? Last night’s Debating Europe debate on the future of nuclear energy in Europe raised many interesting issues that Europe will have to consider in tackling its energy needs. 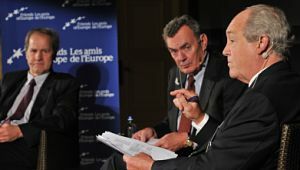 Moderated by Gilles Merritt, Secretary General of Friends of Europe, the panellists were Patrick Moore, arguing in favour of nuclear energy, and MEP Jo Leinen arguing against. Moore was co-founder of Greenpeace and is currently co-Chair of the Clean and Safe Energy Coalition, Honorary Chairman of Environmentalists for Nuclear Energy Canada and Chair and Chief Scientist of Greenspirit Strategies Ltd. MEP Jo Leinen is former Chair of the European Parliament Committee on the Environment, Public Health and Food Safety and has been a prominent spokesperson in the past for the German anti-nuclear movement. Moore opened the debate by arguing that accidents resulting from mining, hydroelectric dams and fossil fuel consumption (through its effects on air quality) kill far more people than nuclear accidents. He stated that no deaths had ever resulted from nuclear accidents and that nuclear plants are among “the safest places on earth”. That is quite a bold statement to make considering that a conservative WHO estimate of deaths resulting from the Chernobyl accident alone is 4,000 people. Independent estimates go much higher. In Chernobyl, Consequences of the Catastrophe for People and the Environment, published by The New York Academy of Sciences in 2010, scientists concluded, based on publicly available medical data, that between 1986 and 2004, 985,000 people died as a result of the disaster. I also wonder if families of the dead Japanese workers at the Fukushima Daiichi nuclear power plant would concur with Moore. Moore castigated the inherent contradiction of Germany increasing its fossil fuel consumption in order to meet its energy needs, all the while claiming that it is concerned with lowering its carbon footprint. In the wake of the Fukushima accident, the German government announced that it will phase out nuclear power altogether by 2022. But Moore claims that this decision was originally made back in 2002, when the Schroder government announced the construction of more gas and coal power plants to replace nuclear power. The big question here appears to be whether concerns for the safety of nuclear power supersede concerns of rising carbon emissions? The German government apparently thinks so. A show of hands from the debate’s audience both before and after the speakers had their say suggests the public thinks otherwise and that nuclear power will have a say in Europe’s future.